Earnshaw is a former Victorian street urchin, turned Nott’m Forest striker. Mars is some awful, radio-lite balladeer that I hope never sullies my consciousness. You could probably squeeze Nani into the middle too. Seriously shite and not funny you’re loosing your touch. finally! someone i’ve heard of! I’ve thought this for a while, Earnshaw and Nani also wouldn’t look out of place in JLS. Bruno Mars looks like the love child of Robert Earnshaw and David Villa, actually. 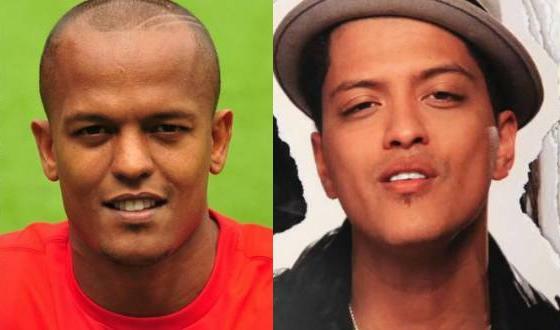 Always thought that Bruno Mars is a whiter Patrice Evra… Think about it! Montesquieu, you obviously didnt see Mick Mccarthy & the train from Goldeneye. Mars and Eanshraw? Works for me! Just saw it now. Chris is trying way too hard to be funny. Failing in the process. Good job!